It’s New Year’s Eve! Either the dumbest or most festive occasion of the year depending on who you ask. I, myself, am torn betwixt the two. If I have something fun planned, then I am all aboard the New Year’s Eve train. If I have nothing fun planned and am pouting, then this holiday barely justifies as such and it’s free to leave the station while I cry on the platform and the smoke swirls around me in a way that is deeply wistful and Dr. Zhivago-esque. Thankfully for everyone around me, this New Year’s Eve is going to be a fun and fancy dinner party with friends, cards, games, topped off with a champagne toast at our neighborhood pub! 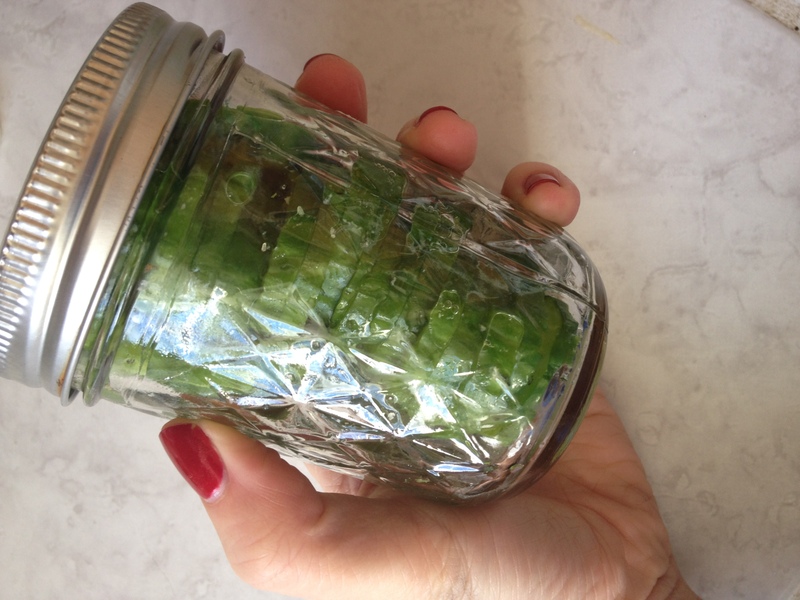 In honor of dinner parties any time of year, I thought it would be fun to share my go-to hostess gift and party must-have: pickles. I know, I know, here we go with the pickling again. But this recipe couldn’t be easier and if you need a quick addition to a charcuterie platter, or just something sweet and homemade to bring to the host, this recipe is for you. If you have five minutes then you can have pickles.
. 2 cloves of garlic, minced or whole. Minced gives a stronger garlic flavor, while whole cloves are more subtle.
. Optional: 1 t. minced jalapeño, to make those pickles spice-aayyy! 1. 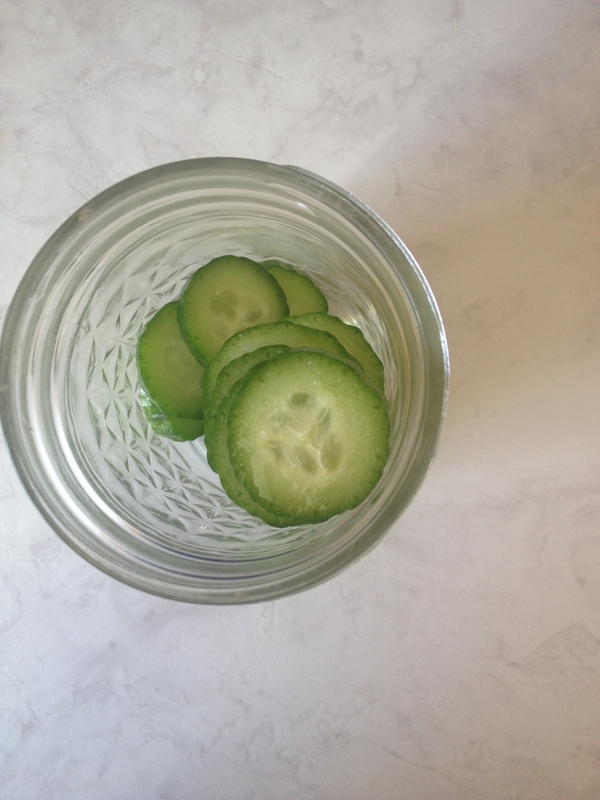 Thinly slice your cucumbers and stack them in a jar. 2. Pour the vinegar over the top. It will seem like not nearly enough, but somehow, it is. Trust, my child. 3. Add garlic, salt, dill, then close the jar and shake it up! Leave in the fridge for at least four hours, but up to overnight before serving. If you can remember, flip the jar a few times, to make sure the brine is evenly distributed. These will keep for about a week and they are beyond. Make them now. PS – these make an excellent addition to dirty martinis. Call me crazy if you must, but there is something about a homemade pickle slice that compliments a cocktail onion in a gin martini in a way that if I’m wrong I don’t wanna be right, right? Right. I need to be honest with you – this post feels like a bit of a sham. It’s like when a popular blogger advises using cake mix to make “the perfect birthday treat!”, or “reveals” that frozen french fries are how she makes her frites so very photo-worthy. Look at me, I’m Sandra Lee. There’s nothing wrong with either of those things – because who doesn’t enjoy a festive Funfetti cake from time to time? (or yearly, no matter how old you get, ahem) – but let’s not get on a high horse about it cowboy! Do you want to make the perfect Christmas treat NO COOKING REQUIRED?! Do you want to create something gorgeous that takes very little skill or effort? Do you want to impress your friends and feel secretly smug? Then have I got a recipe for you!
. 12 ounces of whatever type of dipping flavor you like! 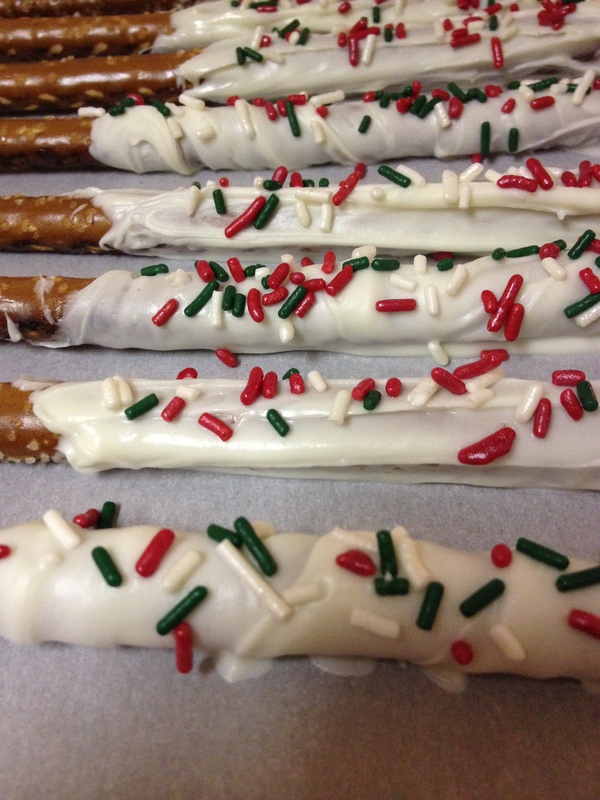 This year, we used semi-sweet chocolate chips, white baking chocolate, and peanut butter chips.
. Large bag of pretzel rods, wherever you can find them! 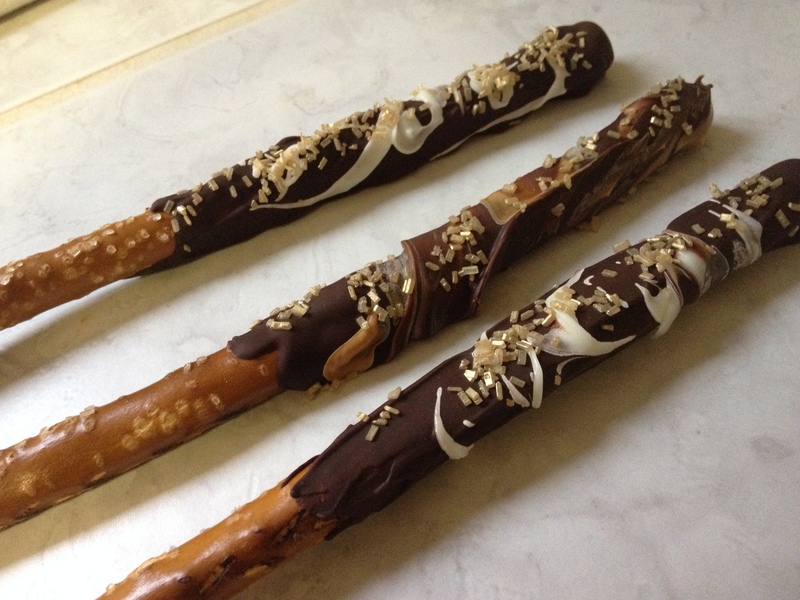 I find that sourcing pretzel rods is one of the hardest parts of this recipe because dang these bad boys are difficult to find. We used Snyder’s of Hanover and they weren’t even broken when we bought them. Kudos to you, neighborhood grocery store!
. Holiday-themed sprinkles and toppings of your choice! We like sprinkles and colored sugar, but mini-M’n’Ms, tiny chocolate chips and mini marshmallows would also be fun! 1. Assemble all the ingredients and lay out a workspace: we cover the table and countertops in waxed paper so we have plenty of room for drying. 2. Coarsely chop the chocolate into small chunks. No chopping needed if you’re just using chocolate chips. 3. Lay either your white or dark chocolate in the top of a double boiler and turn the heat to medium-low. The water should never boil, or touch the bottom of the pan on top. This is especially true for white chocolate (which is not actually chocolate) and peanut butter. They have a much lower heat point, so just stay on low and be patient. You can also melt your chips in the microwave, but I’ve found that method to be faster in the short term and more cumbersome in the long term. Chocolate on a double boiler will keep it’s consistency for however long this project takes. 4. Once the chocolate is liquid, you can start dipping! Depending on the depth of your pot, you can physically dip the pretzel or you may end up spooning it on and smoothing out with a spatula. Either way works. 5. 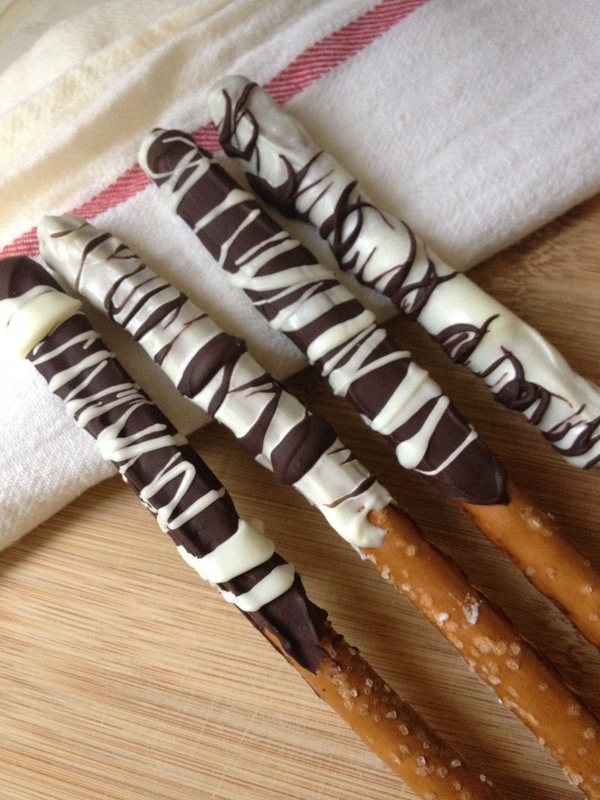 Roll in toppings or sprinkle them on before the chocolate sets. This year, we also did a lot of striping and swirling, which, now that I type it, makes it sound like we were at an old timey church hall dance instead of just hanging in the kitchen. Decorate however works for you. My favorites are the chocolate peanut butter swirl with gold sprinkles. Like Reba says, FANCY. 6. Lay them out on the waxed paper to dry. Let them set overnight, just to make sure they’re good to go. Do you make people take their shoes off in your house? Unless you live in a Japanese temple, you shouldn’t get to do this. I HATE taking off my shoes just to go in the house. I slide all over the floor, I know my outfit is ruined, and I will spend the rest of my time in your home worrying about how we’ll safely escape in case of fire, because we’ll be those idiots who ended up barefoot in the front yard. I am in no way related to Honey Boo-Boo, so standing barefoot in your yard is not something that appeals to me. And yet. If you invite me into your house and ask me to take off my shoes, I will. I love this quote because it’s so true! And if I could modify it slightly, I’d say that manners cost you nothing, but mean everything. Good manners trump everything else. While this wild and crazy idea of manners being important is true no matter where you are – family holidays come to mind, ahem – I notice that it’s especially important while traveling. Part of why we travel – or at least, part of why I travel – is to lose myself and gain a little bit of the world. If you could somehow carry home the sophistication of the French, the wry humour of the Brits, the hospitality of the Singaporeans, and the sheer joie de vivre of the Tanzanians, well…wouldn’t you? Yet, what I see so often when I’m abroad are people very stubbornly clinging to their own culture, despite the fact that they’re in a new place, and their home culture doesn’t hold much water. For example, in France it’s considered basic good manners to say hello to a shop proprietor as soon as you enter, and to thank them upon leaving, even if all you did was browse around. Same goes for entering and exiting a city bus, and leaving a restaurant or museum. In America, we don’t place as much importance on the hello/goodbye ritual, and it’s rare when someone actually calls out, “Thank you!” to the driver of our local Muni bus before she pushes through the melee, myself included. It’s not our culture in America to do all of this greeting and thanking all day long. Perhaps it should be, but it isn’t. So when Americans catch French shop owners rolling their eyes and giving icy replies in French, though you heard them speaking English just moments ago, it’s not because they’re rude, it’s because YOU ARE. You didn’t say hello, you didn’t abide by the good manners of the country you’re visiting. In certain Asian countries, it’s considered rude or invasive to look someone in the eye for an extended period of time. In America, sustained eye contact is good manners and part of a respectful culture. In those particular Asian countries, it’s very bad manners, invasive and rude, and so, I look away, even though it makes me feel awkward. When I was traveling in Tanzania, my friend and I were invited for a family dinner in someone’s home. Being the eco-pretentious 23 year old I was, I was proudly vegetarian with no flexibility. Until they brought out the beef stew they’d spent all day making in honor of our visit. It was not within my culture to eat meat, but good manners mandated that I eat, smile, and say thank you, I’d love more! It can feel uncomfortable or inauthentic to give way on your own culture, but the savvy traveler knows that manners trump culture every single time. Researching a bit about the manners and culture of the country you’re visiting, and being observant of the locals around you can help you fit in and travel more seamlessly. Remember, nobody likes The Ugly American and nobody wants to be one either. 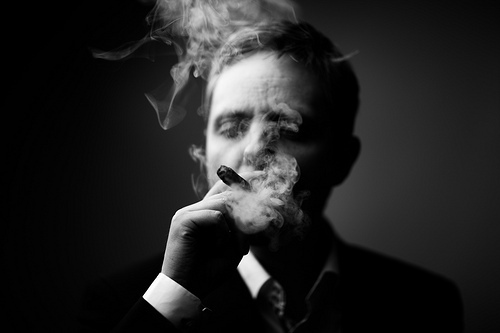 If you can’t stand the smoking, stay out of France. If you can’t handle the meat, stay out of the East African’s kitchen. It’s pretty simple. This also, I think, applies here in the states. We live in a neighborhood with a very strong immigrant population and part of the culture of that population entails a lot of shoving to be first, to get in front, to get ahead. Because I’m in my own country and intimately familiar with my own culture, I feel no remorse about looking the shovers in the eye and firmly moving myself back to where I was in line. And while I do, I’m always thankful I have my shoes on. December is here and we are officially into Christmas here in San Francisco. The lights went up last night, our tiny tree has been decorated (glitter ribbon! glitter ornaments! glitter everywhere! ) and the urge to bake cookies is strong. The urge to raid the Advent Calendar of all it’s treats is also strong, but I have held back. For now. If you make these, let me know what time I should come over. 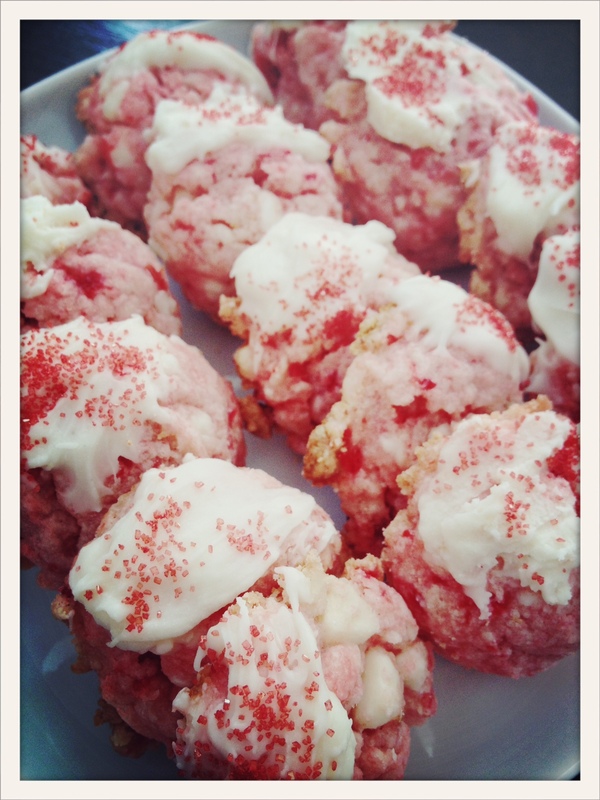 PS – more cookie and entertaining ideas on the Gourmet Style Girl Pinterest boards!